However the QASymphony support site experience hasn’t had any big changes…until today! After several months of planning, designing and organizing, we are excited to release a new, modern experience for our support site. Our hope is that this new support site will drastically improve our customer on-boarding and support experience. Check out the new support site here. 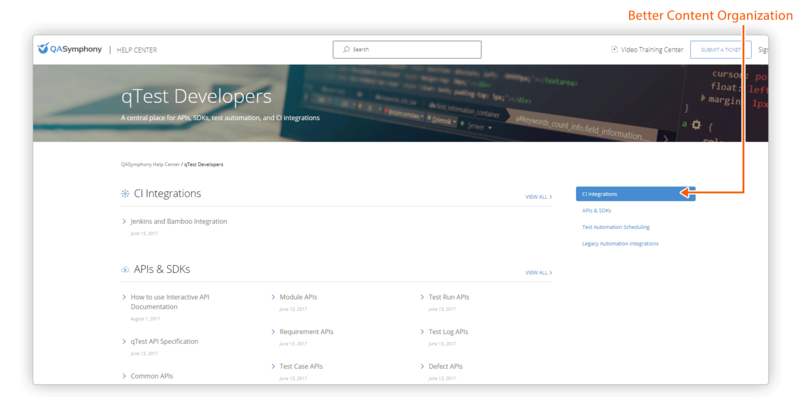 In addition to the support site, we have launched a new interactive API that allows our customers to easily see how qTest APIs can be used for custom integrations (i.e. test automation frameworks). Our new help center was rebuilt, totally from scratch, in order to provide you the most intuitive experience possible. Here are some of the enhancements you will start noticing right away. Each article now contains a sticky navigation that helps you jump to the important parts of the content right away. With this experience, you can see what the article outlines and skip ahead to the content you want to consume. We removed our previous side folder structure in favor of cleaner product categories for content organization. You will also notice improved articles throughout the site to easily set up configurations like Jenkins/Bamboo, JIRA integration, and test automation scheduling. 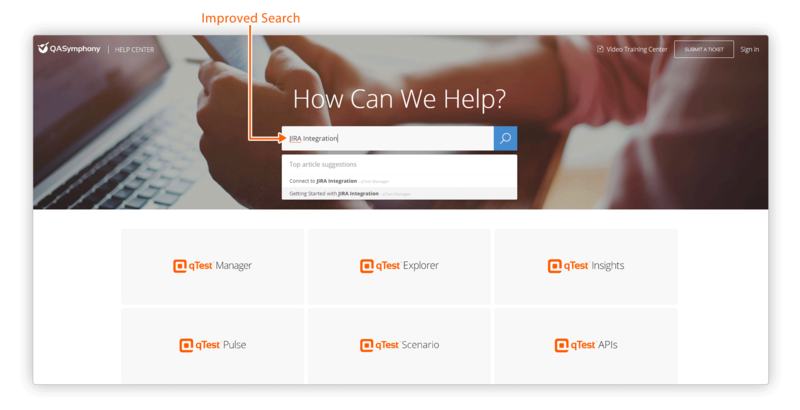 Our new smart search allows you to quickly navigate to relevant content. For example, when searching for “JIRA integration”, I’m greeted with the quick start and deep dive guides, rather than release notes. Have you ever wondered what topics and questions are most commonly searched by other customers? You will now see Popular Topics and FAQs sections for each product area. This helps you get to the answers you need faster without having to reach out with a support ticket. We love that our customers want to integrate and build custom integrations to the qTest Platform. We are now making it a lot easier with our new, interactive API specification documentation. With the new “Try It Out” feature, teams can interact with our API in realtime to validate their integration. Learn more about how to use interactive API documentation or access our new API specification at api.qasymphony.com. We can’t wait to hear your feedback on this release (let us know in the comments section below). For more qTest Manager videos, visit our video training center and get support at support.qasymphony.com.